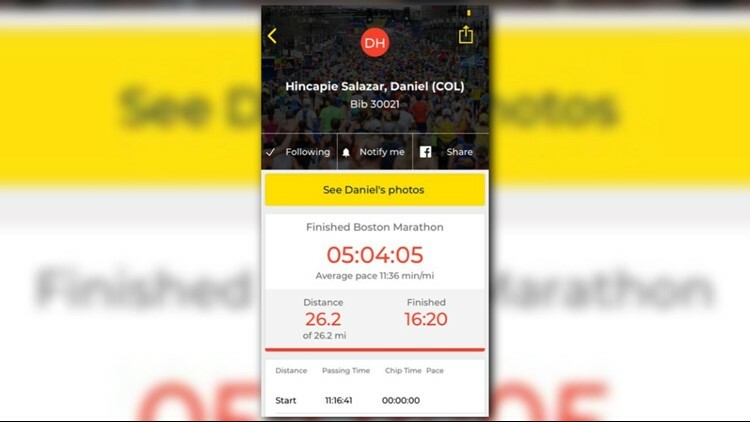 BOSTON — Exhausted and sweaty Daniel Hincapie, 38, could not hold back his tears after crossing the finish line of the Boston Marathon Monday. He ran the race in honor of his late fiancé, Wendy Martinez. “It’s a dream come true and she was there all the way,” he said trying to catch his breath. Hincapie committed to the challenge five months after Martinez, 35, was stabbed during a jog in Logan Circle last year. Martinez dreamed of running the Boston Marathon, but it was Hincapie who would go on to finish the race on her behalf. “It was a very challenging race”, he said. “It was hard but it was really amazing”. During the 26.2 miles from Hopkinton to Boston, he was cheered by thousands of spectators including family and friends of Wendy Martinez. “Watching him run, I could see Wendy”, said Cora Martinez, Wendy’s mother, before she collapsed in tears. Since Martinez’s death, Hincapie has been overwhelmed with support from all over but he is still processing her death. “Love wins, not hate”, he said in an interview before the race. Hincapie, along with family and friends, are now devoting time to the Wendy Martinez Legacy project—a charity in honor of Wendy that supports women through running and technology. The charity announced their first partnership Sunday with Girls on the Run-DC—an organization that builds confidence in girls through training and running. The organization will receive a $6,000.00 grant from the charity. “Our partnership with GOTR-DC, which will teach girls to tap into their own strength and confidence through the sport [of running], is a fitting tribute to Wendy and a promise that her legacy will endure,” said Hincapie.